Ipanema is known all over the world because of the hit song “The Girl From Ipanema” which has given everyone high expectations for the Brazilian girls that roam Ipanema Beach. 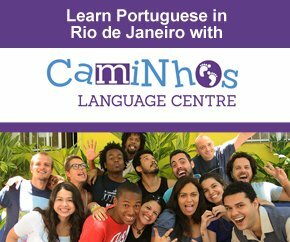 It is true that Ipanema is sort of famous for the good looking locals, but there is a lot more excitement to the neighborhood than just the beautiful people. 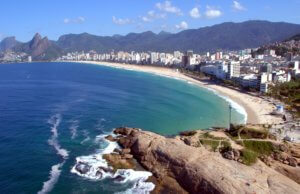 Close to Lagoa, the lake, and Leblon, Ipanema is as well a jackpot for surfers. The neighborhood is all about this sport (other than skating), and makes it clear with the countless surf shops selling handmade boards, and the beach right in front. Apart from this, this upmarket neighborhood is very packed with art and history, because of the artists that used to live there in the past when it was still very affordable (which didn’t apply anymore after the 70’s) to start their careers. Newborn artists flourished in bohemian Ipanema, and current celebrities are always popping in and out close to Posto 9 (a numbered lifeguard station), the hip place to be on the beach. The restaurants are also to be remarked, as there is a bigger cluster of vanguard bistros and independently owned businesses that are more fashionable in Ipanema than anywhere else in town. 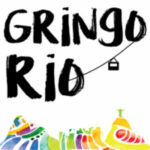 It is crucial to visit this neighborhood at least once if in hope of a complete tour of Rio de Janeiro. Postos 7 through 10 mark the stretch of what is Ipanema beach. Right after Copacabana, the first sign of Ipanema is the large rock of Arpoador (small area of the neighborhood), recognized for its radical waves. This part of the beach, about 500 meters long, is where the biggest concentration of surfers lie, and with good reason; it is a great place for surfing, and to learn how to surf. 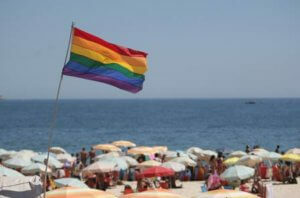 More ahead is Posto 8, streaked with gay flags and muscled men. It promotes a taste of the twenty-first century society, and a relaxed vibe. Posto 9 is the most popular stretch of the beach, due to the etched history left by the same hippies and artists that roamed the early streets of Ipanema. Posto 9 nowadays attracts a trendy crowd, where the scent of marijuana sometimes is hard to escape. In between Posto 9 and 8 you can find Farme de Amoedo street, loaded with bars and restaurants and gay friendly. Bending away from the beach and in direction of Copacabana, is Rua Francisco Otaviano, the street where Galeria River is located. It is a surf gallery packed with all the equipment a practitioner could possibly need. Beyond surfing gadgets, Galeria River houses skating shops too. Inside and next to the gallery are small restaurants that serve mainly fastfood and the superfruit açai bowls (and cups). There is no better feeling than packing on all the calories lost in a surf session with a juicy cheeseburger and a hit of Brazilian açaí. Along the streets continuing Ipanema, are a lot of mainstream high end brand shops, and a series of trendy bars. Worth noting: Bar Astor at the seafront, interiorly designed art deco style serving exotic drinks and well prepared seafood bites. For something more fulfilling, a stop by Zazá Bistrô Tropical will satisfy any cravings for a punch of Moroccan cuisine. 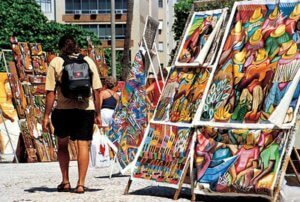 It isn’t the full Ipanema experience if one doesn’t visit the Hippie fair, where artists set up their isles and display a varied assortment of delights. This can range from paintings to handmade soaps or antique map art. In the 1960s, a party of local hippies set up a few booths to attempt selling their products. As the years rolled by, more people joined in, receiving no objection from the creators. It grew to the point that is became a full on market, lasting for the entirety of every Sunday. 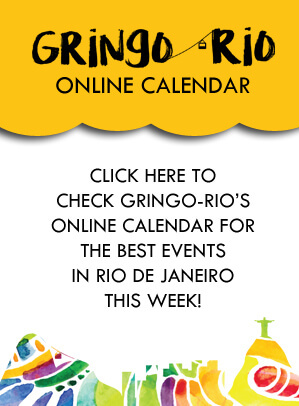 Held every Sunday, the hippie market is Rio’s sweet spot to purchase the perfect takeaway gift that testifies one’s time in the city. If in the fair during lunch hours, it is always an excellent idea to nibble on some Bahian food, available in stalls on the outskirts of the market. The go-to choice is acarajé, the most legitimate Bahian snack out of the menu. It’s a croquette accompanied with prawns, black-eyed peas and the Brazilian delicacy, manioc paste. For a large diversity of people, and an easy chance to make a couple of carioca acquaintances, one must visit Ipanema without second thoughts. It doesn’t hurt to explore the neighborhood thoroughly and perhaps take more than one day off the calendar to relish in all of its surprises.